Outstanding beach front villa with modern facilities and accommodation for 12 adults or 10 adults and 4 children. 10 minutes from the airport and from Chaweng, the main shopping and night life area. Occupying a peaceful tropical cliffside that steps gently down to an undisturbed beach just a short drive north of Koh Samui’s main tourist town, Chaweng, Villa Sangsuri 3 is one of three spectacular private villas that together make up the Sangsuri Estate. This stunning 5-bedroom villa is designed as a series of luxurious living and sleeping pavilions, set on four levels, and connect- ed by stepped pathways spread through attractive landscaped grounds. The property overlooks a meditative bay that is home to the postcard-perfect offshore island of Matlang. Villa Sangsuri 3 features an appealing choice of private and communal spaces for guests exclusive use. It is therefore perfectly suited to groups of friends or families looking to share the benefits of a personalised island holiday retreat, without ever feel- ing either cramped or restricted. The lower level beachside spa is an indulgent inclusion, even for a luxury villa of this size, and the addition of private cinema room behind the lounge adds yet more appeal to the wide ranging facilities on offer. 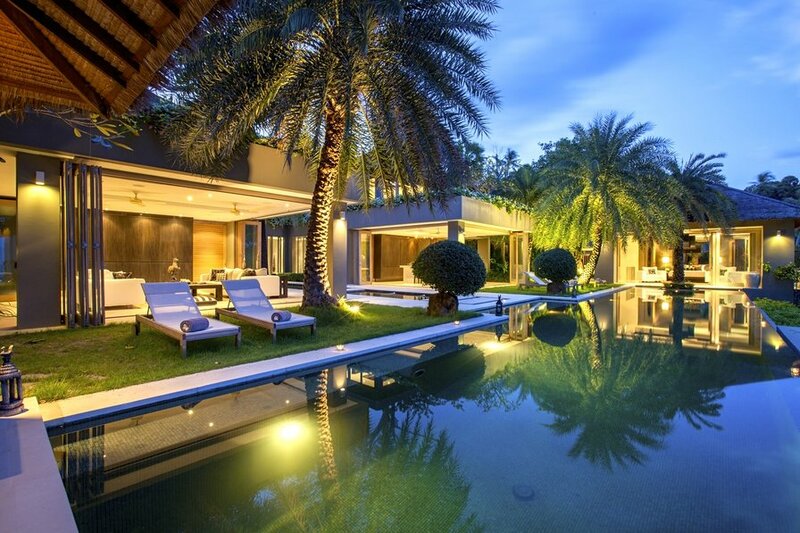 Despite being one of the only luxury villa estates on Samui within easy reach of the many shops and nightlife options in Chaweng, Sangsuri Villa 3 an its neighbouring properties enjoy one of the most secluded and peaceful locations on the island. The sheer size of the property and generous amount of private space available to guests, coupled with the fact that two or even all three villas can be rented together, also makes this one of the most attractive choices on the island for a private wed- ding, a group celebration or even a corporate retreat.